The nucleus of this piece was written as material for the Survey of London’s monograph on County Hall. In the end very little of what I had written was used. Meanwhile, as more and more interesting information relating to the chairmen and chairwomen, their portraits and the artists came my way, I rewrote the piece. Thus what began as a brief history of the portraits slowly expanded into an informal history of the work of those men and woman who took the Chair of the London County Council and the Greater London Council and the impact they had on their work of those bodies. Most of the material was gleaned from the Council’s Minutes and the LCC?GLC departmental files kept by the Greater London Record Office. I also recorded some of the people who visited County Hall and generally included any interesting items relating to the Councils and their County Hall, which caught my eye. Finally I have included many items of artistic or historic interest which are not in the Heritage Collection but for which the Council was responsible including many statues and commemorative drinking fountains. It is a very personal scrapbook. I hope it proves as interesting to the reader as it has to me. I have arranged the narrative in the form of an annual diary. The numbers in brackets were those I allocated to items in the Heritage Collection. Most if not all the paintings are now owned by the City of London Guildhall Art Gallery. The Portraits. A unique collection of eighty-nine portraits of all but one of the Chairmen and Chairwomen of the LCC and GLC from the creation of the former to the abolition of the latter passed into the hands of the London Residuary Body on 1 April 1986 under the terms of the Local Government Act 1985. The collection comprised works by some of the most outstanding, as well as some good, indifferent and downright bad artists working between 1889 and 1986. In all, the collection represents an extraordinary display of the art of portraiture during that period and includes works by Orpen, Lavery, Sargent, Clausen, Llewellyn, Rivers, Nicholson, Henry Lamb, Strang, Philpot, Ruskin Spear, Moynihan, Halliday, Lamb and Francis Dodd. Some of the artists are represented by two or more works. The majority were Royal Academicians. All the portraits, at some time or other, have been displayed on the walls of County Hall. All are now the property of the City of London’s Guildhall Art Gallery. There is no doubt these portraits brought a much needed human element to County Hall’s acres of oak and marble panelling and represent a record of the men and women who for 97 years played some part in the history of local government in London and their patronage of the arts. The majority of the Chairmen were extremely busy in public life, a proportion were MP’s, one became Prime Minister, all, without exception held a variety of public offices outside the LCC and the GLC. No history of London local government can omit reference to the contribution they made. When I originally wrote this piece no public record has been made of the collection and they were virtually unknown, unpublished and uncatalogued. However, the oil paintings can now be found in the catalogue of the Public Catalogue Foundation – Oil Paintings in Public Ownership – City of London and on screen under artuk. The oil paintings have also been published in the Catalogue of Paintings in British Collections, Visual Arts Publishing, 1993. The Record Office, Kenwood and other collections. The London Residuary Body also inherited, on 1 April 1986, a collection of paintings, prints, silver, glass, objets d’art and items of historic interest which was known as the GLC Heritage Collection. These in turn had been acquired or inherited by the GLC from the LCC, the Middlesex County Council and the Metropolitan Board of Works and a number of other predecessor bodies. Another major collection made by these bodies, consisting of paintings, drawings, maps, prints, photographs, books and records, which were acquired for the adornment of County Hall, use in its library and preservation in its archives was kept by the GLC’s Record Office and History Library. The library, together with this collection, was moved from County Hall to Clerkenwell and under the terms of the Local Government Act 1985 was transferred to the City of London. An important collection of drawings, paintings, prints and maps together with items of architectural interest which were acquired by the Council’s Historic Buildings Division of its Architect’s Department were transferred to English Heritage. Kenwood House, Marble Hill House and Ranger’s House also went to English Heritage together with their magnificent collections of paintings, furniture and jewellery which had been gifted or bought by the LCC/GLC. Chief among these were the Kenwood Collection left to to the LCC by Lord Iveagh and the Suffolk Collection (including a magnificent collection of Jacobean portraits, some by William Larkin) given to the GLC by the Hon. Mrs Greville Howard. The LCC and the GLC had augmented these collections over the years with purchases of paintings and furniture, thus leaving English Heritage a unique collection of works of art. The Horniman and Geffrye Museums were transferred to the Inner London Education Authority together with their collections. There were also the Council’s parks, squares and open spaces which were also enriched with sculptures, as had the Royal Festival Hall. The former were transferred to the London Boroughs and the latter to the Arts Council. The GLC Heritage Collection 1985. Within days of the passing of the Local Government Act 1985 which abolished the GLC, work began on a catalogue of all the paintings, sculptures and objets d’art which were displayed or kept in storage at County Hall. Tony Banks MP, the last of the chairmen of the GLC instigated the creation of the catalogue which was eventually to be known as the GLC Heritage Collection. He called on two members of staff, myself and the photographer Peter Barrett. Whilst serving in the Council’s legal department I had, over many years become fascinated by the portraits some of which I had glimpsed in various parts of County Hall, including the cellars. The reason why I had been chosen was that I had written to the Chairman’s Office advocating that a catalogue be made of the portraits. The chairman agreed that I could make my own private catalogue of them, provided I did it in my own time and my own expense. I had therefore set about privately photographing and cataloguing those portraits which I could locate. A few weeks later, presumably prompted by my letter, Banks had a wake up call and gave me the task of compiling an official catalogue of everything of historic or artistic value displayed or stored in County Hall and I was joined by Peter Barrett, of the photographic unit of the architect’s Department who was chosen to make a photographic record of all I found. I was also given the services of two porters and someone to type out my notes. We began with the Chairmen’s portraits and the large group paintings and concluded our work days prior to abolition, having catalogued more than 1000 items. Banks. But for Banks’s prompt action during those last months of the GLCB in demanding and ensuring that the Council create a catalogue of its art treasures and valuables, it is possible that many of them would have been lost or stolen or just have strayed prior to 31 March 1986 the last day of the GLC. The catalogue ensured that the items were identified and catalogued and the placing of them in storage prior to the abolition of the GLC ensured their safety. Captain George Swinton, of whom more later, would certainly have been grateful to him. He would not have approved of the Chairman of the London Residuary Body, Sir Godfrey Taylor, who inherited the collection, and whose first reaction to the portraits was that they were ‘rubbish’ and should either be given to the sitters or their relatives or sold off! Fortunately wiser heads prevailed. As for rest he was determined to sell off as much as possible. County Hall and the portraits, 1922. During the move to the newly opened County Hall in 1922, the Council’s collection of portraits of all its past Chairmen was brought over and hung, experimentally, in various areas of the principal floor. It was reported on the 28 November that ‘As the Council is aware, these portraits have for a long time past been painted year by year by contemporary artists of eminence, who have in each case generously executed the work at practically a nominal fee, the cost being borne by private subscriptions from members of the Council. Each portrait so painted has been presented to the Chairman concerned after relinquishing his office and has been presented back by him to the Council. In this way (and otherwise in a few cases) the Council has had the good fortune to become possessed of a portrait of each Chairman of the Council who has carried out the duties of the office since the formation of the Council in 1889. The total number of portraits is at present 28. However, notwithstanding the large size of the building there are on the principal floor, comparatively few positions in any way suitable for the portraits.’ The Establishment Committee whose task it was to hang the portraits set themselves the following conditions: ‘(a) The portraits having been painted by eminent artists should be displayed in the best possible positions from the artistic point of view. (b) they should be hung in positions where they can be readily seen by members of the public visiting the building and (c) they should as far as possible be hung together.’ The suggestions were that they be hung (i) as a frieze in the members’ library, (ii) on the panelled walls of the members’ reading room or refreshment rooms (iii) on or over the panelling of the corridors in positions opposite windows and (iv) on the panelled walls of the ‘aye’ and ‘no’ lobbies of the Council Chamber. Apparently, prior to the report to the Council some of the portraits had been placed experimentally in all these positions, so that members could decide for themselves. In view of the ‘considerable diversity of opinion, among members on the matter’, the committee sought the advice of the President of the Royal Academy, Sir Frank Dicksee, Sir William Llewellyn, RA, who had painted one of the portraits, and Richard Jack who had just painted the last chairman Sir Percy Simmons. The group visited the building and recommended in a report that the ‘most appropriate and suitable positions for the portraits in every way would be the two central top-lighted lobbies (i.e. the ‘Aye’ and ‘No’ lobbies) which would suitably take 18 pictures each, i.e. the whole of the then existing portraits, with space for a further eight’. They also recommended that the portraits should be varnished, put under glass ‘as a preservative from the effects of the London atmosphere’, and reframed in a uniform manner in a type of frame which they personally recommended. Lastly they commented that the portraits ‘should be hung as flat as possible on the panelling, but not fixed to it in any way. Llewellyn and Jack also generously offered their services gratuitously in advising on the hanging and arranging of the portraits.’ In the event, Llewellyn and Jack changed their recommendation as to the hanging of the portraits and it was finally decided to place only one portrait in each of the 20 panels in the lobbies and to hang the remainder elsewhere. The Council accepted the advice and help and agreed the recommendation. The small collection, for which so much thought and time had expended, contained works by Clausen, Orpen, Orchardson, Herkomer, Alma-Tadema, Poynter, Strang, McEvoy and Philpot and was remarkably representative of leading contemporary portrait painters. Captain George Sitwell Campbell Swinton, DL (10 May 1859 – 17 January 1937). Swinton was born in Edinburgh, the second son of Archibald Campbell Swinton of Kimmerghame, Berwickshire, and Georgiana Caroline Sitwell, daughter of Sir George Sitwell, 2nd Baronet of Renishaw. In 1895 he married Elizabeth Ebsworth, OBE, daughter of E.H. Ebsworth of Gattonside. He studied art under Hubert von Herkomer at Bushey. Swinton was gazetted to the 71st Highland Light Infantry in May 1878, promoted to lieutenant on 23 January 1881, to Captain on 11 September 1888, and retired in 1893. He was an extra Aide-de-Camp to the Marquess of Lansdowne when he was Viceroy of India from 1888-1894. Swinton was a Member of the London County Council representing Holborn from 1901 to 1907 and Dulwich from 1922 to 1928. He was Chairman of the Parks and Open Spaces Committee from 1904–1905, and Chief Whip of the Municipal Reform Party (the Conservative group on the Council) from 1903 to 1912. He was an Alderman from 1907 to 1912, and 1920 to 1922. He became Chairman of the London County Council in 1912, but resigned on accepting the post of Chairman of the Town-planning Committee of the new Imperial City of Delhi. He was duly fined £1 as prescribed by Standing Order No.12(2) of the Council. He was attached by the Colonial Office to the Representatives of the Overseas Dominions attending the Imperial Conferences in 1917 and 1918. He is chiefly remembered in Scotland for the prominent part he played with the Duke of Athol and Sir Robert Lorimer in connection with the erection of the Scottish National War Memorial unveiled in Edinburgh Castle on 14 July 1927. Swinton also served as March Pursuivant of Arms Extraordinary. He was Albany Herald of Arms in Ordinary from 1923 until 1926 and served Lord Lyon King of Arms and was Secretary to the Order of the Thistle from 1927 until 1929. He is also the great-grandfather of the actress Tilda Swinton. 1933. Swinton’s note on the portraits. At the age of 74, just four years before his suicide (he shot himself with his service revolver having suffered acute pain for years despite two serious operations), he sent to the Clerk of the London County Council, for retention in the Council’s archives, a note on Portraits of the Chairmen of the London County Council – 12 June 1933. This was deposited with the Greater London Record Office and is now presumably held by the City of London. Swinton began his account of the creation of the collection of Chairmen’s portraits: “There are now hanging in the lobbies and rooms of the Council Hall 40 portraits of the men who have presided over the County Hall of London since it came into existence, and it may be useful, historically, to place on record some sort of account as to how this interesting collection originated and the lines on which it has grown so far, and will, we hope – continue to grow. The first thirteen portraits 1889-1890. Archibald Philip Primrose, 5th Earl of Rosebery, 1st Earl of Midlothian, KG, KT, PC (7 May 1847 – 21 May 1929) was a Scottish Liberal statesman who served as Prime Minister of the United Kingdom from 5 March 1894 to 22 June 1895. Swinton in his account then refers to the earliest portraits, the first being of the 5th Earl of Rosebery. He was the first Chairman of the London County Council – 1889-1890 and 1892 who represented the Progressive Party on the Council Rosebery himself had originally stood as a non-party candidate in the hope that the Council would not be run on party lines. This was not to be, so he subsequently became a Progressive. The Progressives, as opposed to their rivals the Moderates who later became the Municipal Reform Party (Conservatives in all but name), sought wide municipal control of the police and the gas, electricity and water services. The introduction of their ill-fated steam-boat service led to the downfall of the party in 1907. Rosebery was educated at Eton and Cambridge but was expelled from the latter because of his preference for horse racing over studies. He inherited his peerage at 21 years of age and suffered from insomnia. He declared he had three ambitions in life: to be Prime Minister, marry an heiress and win the Derby. He won the Derby three times (1894, 1895 and 1905), married a Rothschild and was chosen by Queen Victoria to follow Gladstone as Prime Minister. He was the last politician to attempt to run the Government from the House of Lords. As Chairman of the LCC Rosebery impressed everyone with his extraordinary authority and his aptitude for detail which enabled him to be a considerable force in guiding the proceedings of the new authority and clearly gave it a valuable degree of distinction It is remarkable that he personally advocated, among many other municipal reforms, that the Corporation of the City of London should be merged with the LCC. He also considered that the LCC should take over control of the police in London. Swinton describes Rosebery’s portrait, which was ‘after and touched by’ G.F. Watts, to be a good likeness. First Meeting of the LCC in its new Council Chamber by Henry Jamyn (Jermyn) Brooks (1865-1925) (no.95). Lord Rosebery also appears in the large group picture of the meeting of the LCC in the County Hall, Spring Gardens, London on 22 April 1890. The first meeting of the LCC had been on the 21st March 1889. The council chamber in Spring Gardens depicted in the painting of the Meeting of the LCC was situated in the Old County Hall. It had formerly been the headquarters of the LCC’s predecessor the Metropolitan Board of Works, and was on land leased from the Crown and situated just off Trafalgar Square at the end of the Mall to the left of what is now Admiralty Arch and facing Cockspur Street. The original accommodation in 1889 for the first meeting of the LCC was decidedly cramped. The Board Room of the MBW could barely seat 45 members while attendance was in the region of 80 or 90. Members were reduced to have their meetings in the City of London’s Council Chamber. Clearly a large Council Chamber was needed and one was erected in Spring Gardens for the princely sum of £9,000 and the first meeting in the new Council Chamber was held on 21 April 1890 and it is this chamber which is depicted in Brooks painting. Brooks specialised in portrait groups and has work in the National Portrait Gallery and the Royal College of Surgeons. The ‘Meeting of the LCC’ is presided over by the Chairman Lord Rosebery and is remarkable for the care and attention with which every person present is depicted; each and every one a miniature portrait in its own right. Ten members present were MP’s, ten were to become future chairmen of the LCC, other members present included seventeen knights, six lords and two earls, Miss Emma Cons (1838-1912), social reformer, educationalist and theatre manager, who, 9 years earlier had re-opened the old Vic and the philanthropist, Quintin Hogg (1845 – 1903). Henry Jamyn (Jermyn) Brooks (1865-1925). Some notes on a file relating to the painting include memories of Percy J. Edwards and H. Hobbs. In 1929 they recalled that Brooks was ‘a spare man of medium height and always gave the impression that, like some poor struggling artists, he was half-starved in the interest of his art’. He always carried a walking stick as one leg was shorter than the other. Edwards recalls that he was very intelligent and reserved and ‘easily excited one’s pity’. Some years earlier, his son, Sidney Malcolm Wellbye Brooks (1874-1899), a missionary, was murdered in China during the Boxer Rebellion. It appears that Brooks had been granted the use of a room in the roof of the old County Hall in order to work on the painting, and made ten-minute sketches of each member before transferring them to the canvas. The painting took eighteen months to complete during 1907-1908 and included some members who had died since the first meeting had taken place in 1889. A committee had been formed to obtain subscriptions from members with a view to presenting the painting to the Council but they only managed to scrape together 30 guineas and therefore ‘the artist took it upon himself to present the painting to the Council as a gift’. This generous gesture apparently upset the committee who considered they had the right to make the presentation on the strength of the sum they had managed to collection. However the Council informed them that they were going to accept it direct from the artist and did so. Recollections as to what followed are a bit muddled but it seems that Brooks made a request to the Council to have engravings made of the painting, presumably for sale to raise some money for himself, but the Council declined to allow him to do so and Edwards recalls that following this ‘the poor fellow was found on the floor of the studio half dead, he had made an unsuccessful attempt at suicide’. In 1938 the painting was found to be in a bad condition and was sent to be cleaned and the stretchers tightened. It was also ordered that the outer frame ‘which is of coarse ornamental design and in bad condition,’ should be removed and the inner gilt frame retained as its sole support. Unfortunately this proved to be quite inadequate and the painting was in dire need of restretching in 1986. The Hon. Harry Lawson Webster Levy-Lawson MP, later 1st Viscount Burnham (1862 – 1933). The Heritage Collection contains a small commemorative medallion (no.315) which related to the first LCC. On the obverse is a profile bust of Levy-Lawson and the inscription ‘First Election London County Council West St Pancras’ The reverse is inscribed ‘A keepsake from Harry L. W. Lawson, MP, CC, London 17 January 1889’. Lawson appears in the group Painting of the Meeting of the LCC. Lawson sat for the Moderate Party on the Council for West St Pancras (1889-1892) and later for Whitechapel (1897-1904). He was a newspaper proprietor and a Liberal Unionist politician who sat in the House of Commons between 1885 and 1916 when he inherited his peerage. MP for West St Pancras, 1885, Cirencester, 1893 Mile End 1905 and 1910. In the interim he was Mayor of Stepney 1907-1909. Henry Meyer. One member at least is known to have been omitted from the painting of the Meeting of the LCC as in 1924 the Council rejected a request to add Henry Meyer, Progressive Party, Member for Kennington (1889-1892) who had been at the meeting but does not appear in the painting. 1890-1892. Sir Henry Morton Stanley GCB (1841 – 1904). The Chairman, Rosebery) informed Members (Minutes 29 April 1890) that he was able to offer 60 tickets of admission to the Guildhall on 13 May 1890 for a reception for Stanley on his return from Africa having rescued Emin Pasha, (alias Isaak Eduard Schnitzer) the governor of Equatoria in the southern Sudan and discovered the ‘Mountains of the Moon’ (the Ruwenzor range). Stanley had found Livingstone in 1871. The tickets were appropriated by ballot. The Chairman announced the result of the ballot during the meeting! The resignation of Lord Rosebery. At the meeting of the Council on 15 July 1890 the following was read: It is my duty to report that on the 14th instant I received a letter from the Earl of Rosebery resigning the office of Chairman of the Council. I received from him at the same time the sum of £1, being the fine imposed by the Standing Order of the Council…’ The Chairman then read Rosebery’s letter out to the Council. ‘My dear Lubbock. As it will fall to you at our next meeting to declare the Chair of the Council vacant, I would ask you to be the channel of my last message to the Council of gratitude for their generous and constant confidence. They will easily find a better chairman, but not easily one more loyally devoted to their interests, welfare and success. And it is a happiness to me to believe that I leave behind me many friends. Yours sincerely, Rosebery.’ The Council then resolved to receive Rosebery’s resignation ‘with the deepest regret’ and tendered him ‘its hearty thanks for the devotion with which he had discharged the duties of the office, and for the courtesy and kindness he had uniformly displayed’. It also put on record ‘its high appreciation of the wisdom and ability he had shown in presiding over the meetings of the Council and also in rendering advice and guidance to individual members and to Committees in the discharge of their duties’. No other resigning Chairman was to receive such high praise from Members of the Council. The following are some of the statues and commemorative drinking fountains which were maintained by the LCC. 1839. Gothic Stone Cross commemorating Joseph Booker. Courtyard of the former St Mary’s School, Lincoln’s Inn Fields. Booker was the Honorary Secretary of the Associated Catholic Charities. The cross was erected by public subscription in 1839. 1862. The Victoria Fountain designed by the architect Henry Astley Darbishire (1825-1899) in Victoria Park. 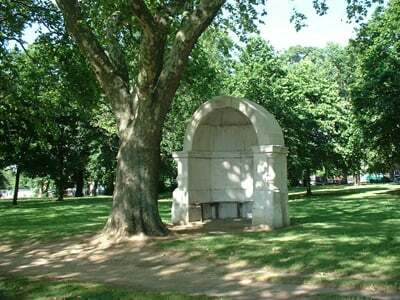 A large ornamental drinking fountain in the shape of colonnade surrounding an octagon, four sides of which are occupied by fountains. The figures supplying the water are carved from Sicilian marble the remainder of Portland and Kentish ragstone and red and grey granite. It was presented to the Council by Baroness Burdett-Coutts, cost £5000 and was inaugurated on 28 June 1862. 1871. Bronze statue of Lieutenant-General Sir James Outram (1803-1863) by Matthew Noble (1817-1876). Victoria Embankment Gardens. On a pedestal of polished granite. Behind him some rockwork, a helmet and a mortar. At the four corners are groups of Indian arms and trophies. It was unveiled on 17 August 1871. Photograph by James Freidus. Victoria Embankment was designed by Sir Joseph Bazelgette and opened to the public in 1865. 1874. Leicester Square. Fountain surmounted by a statue of William Shakespeare (1554-1616) (after Peter Scheemakers (1691-1781)) designed by Sir James Knowles (1831-1908) and sculpted by Giovanni Fontana (1821-1793). The fountain is surrounded by four marble busts. Marble Bust of William Hogarth (1697-1764) by Joseph Durham (1814-1877), Marble Bust of John Hunter FRS (1728-1793) by Thomas Woolner RA 1825-1892), Marble bust of Sir Isaac Newton FRS (1642-1727) by William Calder Marshall RA (1813-1894). Unveiled on 2nd July 1874. Leicester Square was owned by Albert Grant MP who commissioned the fountain and sculptures and handed the Square to the LCC’s predecessors the Metropolitan Board of Works. in 1874. 1877. Bronze statue of Isambard Kingdom Brunel (1806-1859) by Baron Carlo Marochetti (1805-1868). Victoria Embankment Gardens. Portland stone pedestal flanked by a screen of the same material was designed by Norman Shaw. Brunel is holding a pair of dividers. Subscriptions for the statue were begun in 1859 and for some time the statue la in a Government store, awaiting arrangements as to a possible site. In 1871 the Metropolitan Board of Works gave permission for the statue to be erected on the Victoria Embankment Gardens and in 1877 the works were completed and it was handed over to the MBW. 1878. Bronze statue of John Stuart Mill (1806-1873) by Thomas Woolner RA (1825-1892). Victoria Embankment Gardens. Pedestal of Portland stone. Erected on the 26 January 1878. 1880. Bronze statue of Robert Raikes (1734-1811) by Sir Thomas Brock RA (1847-1922). Victoria Embankment Gardens. The pedestal is of Cornish grey granite. Erected at the cost of £1,200 under the direction of the Sunday School Union by contributions from teachers and schools of Sunday schools in Great Britain. Unveiled on 3rd July 1880. 1882. Bronze statue of Thomas Carlyle (1795-1881) by Sir Joseph Edgar Boehn RA (1834-1890). Chelsea Embankment Gardens. Carlyle shown wrapped in a loose dressing gown seated in his armchair. Unveiled 26 October 1882. These small gardens were created after the Thames was embanked by Sir Joseph Bazalgette in 1869-74. Chelsea Embankment was officially opened in May 1874 by Lieutenant-Colonel Sir James MacNaughton Hogg, Chairman of the Metropolitan Board of Works. 1883. Drinking Fountain commemorating H. Hay Hill. Albert Embankment on the wall of St Thomas’s Hospital. Made of polished grey granite. Erected in January 1883. The embankment was created by Sir Joseph Bazalgete for the Metropolitan Board of Works between July 1866 and November 1869. 1884. Bronze statue of William Tyndale (c.1490-1536) by Sir Joseph Edgar Boehn RA (1834-1890). Victoria Embankment Gardens. Pedestal of Portland stone. Tyndale, standing, in doctor’s robes, his right hand laid on an open copy of the New Testament resting on a primitive printing press. Hold in his left hand a manuscript and other books and a scroll are at his feet. Cost £2,400 by public subscription. Unveiled on 7 May 1884. 1884. Drinking Fountain commemorating George Gowland. Hackney Downs. Made of polished grey granite. Erected in May 1884. The Downs open space was originally common land, preserved from the 1860s as parkland. 1884. Bronze statue of Robert Burns (1759-1796) by Sir John Steel (1804-1891). Victoria Embankment Gardens. Poet is shown in rustic dress, seated on the broken stump of a tree in the act of composing. Near the foot of the statue is a scroll and a broken ploughshare. The statue was the gift of John Gordon Crawford. Unveiled on 26 July 1884. 1884. Drinking fountain commemorating M. A. Lupton. Brook Green. Made of polished grey granite. Erected in 1884. 1884, Drinking Fountain commemorating Jabez West. Southwark Park. Made of grey granite. Erected in 1884. West was a member of a local Temperance Society. Southwark Park first opened its gates to the public in 1869, and was one of the earliest parks to be opened and run by the LCC’s predecessors the Metropolitan Board of Works. 1886. The Henry Fawcett Fountain designed by Basil Champneys and sculpted by Mary Grant (c.1840-1908). Victoria Embankment Gardens. Contains a bronze medallion of the head of Henry Fawcett (1833-1884) the blind Postmaster General British, who was an academic, statesman and economist. Unveiled in 1886. 1887. Fountain with bronze bust of Dante Gabriel Rossetti (1828-1882)designed by J. P. Sedding and sculpted by Ford Madox Brown (1821-1893). Chelsea Embankment Gardens Fountain of light coloured grey granite. Unveiled Holman Hunt on 14 July 1887. 1888. Bronze statue of Sir Henry Bartle Frere (1815-1885) by Sir Thomas Brock (1847-1922). Victoria Embankment Gardens. Wearing civil service uniform with flowing robe of the Order of the Star of India. Pedestal of light grey granite. Unveiled on 5 June 1888. Cost £3000. 1890. Bronze statue of William Edward Forster (1819-1886) by Henry Richard Pinker (1849-1927). Victoria Embankment Gardens. Standing with book in left hand on pedestal of unpolished granite. Inscription states To his wisdom and courage England owes the establishment throughout the land of a national system of elementary education. Unveiled on 1st August 1890. 1890. Drinking Fountain in commemoration of Joseph Beck (1828-1891) and John Runtz (1818-1891). Clissold Park. Drinking fountain of polished red granite. Erected in 1890. The Metropolitan Board of Works bought Clissold estate in 1887 for the creation of Clissold Park. Joseph Beck a manufacturing optician and politician and John Runtz a local politician were leading proponents of the purchase. Beck became a member of the first Council of the LCC. 1890. Drinking Fountain commemorating John Bright (1811-1889). Victoria Park. Polished grey granite. Erected in 1890. Bright was a Quaker and a Radical and Liberal statesman, one of the greatest orators of his generation and a promoter of free trade policies. Victoria Park was opened in 1845. 1890. Drinking Fountain in commemoration of Michael Young. Hackney Downs. Polished red granite. Erected in 1890. Hackney Downs opened as a public park in 1884. 1890-1892. James Stuart (1843–1913) was Leader of the London County Council. Sir John Lubbock, 1st Baron Avebury, PC, FRS DCL LLD (1834 – 1913) by the Honourable John Maler Collier OBE, RP, ROI (1850– 1934) [no.2]. Chairman of the LCC 1890-1892. Lubbock was a banker, Liberal politician, philanthropist, scientist and polymath. He established archaeology as a scientific discipline and introduced the first law on the protection of the UK’s archaeological and architectural heritage. As a young man he became one of the closest of Charles Darwin’s young friends. Darwin lived nearby. He was the author of many books and became president of many bodies including the Society of Antiquaries and took his title from the stone circle at Avebury. It was Lubbock who proposed the division of the Stone Age into the Palaeolithic and Neolithic. As an MP he was closely connected with the Bank Holiday Act 1871 which gave statutory recognition to Bank Holidays. He also represented the City of London on the Council and was a member of the Moderate Party. Lubbock was painted by the Hon. John Collier in 1892. Collier also happened to be the younger brother of Lord Monkswell [No.11]. Collier trained at the Slade and then in Paris and Munich. He also painted a number of historic set pieces and wrote books on painting. I have to quote some of his views in The Religion of the Artist which he published in 1926. “People may claim without much exaggeration that the belief in God is universal. They omit to add that superstition, often of the most degraded kind, is just as universal.” And “An omnipotent Deity who sentences even the vilest of his creatures to eternal torture is infinitely more cruel than the cruellest man.” Hmmm. Collier and Leonard Watts (1871-1951) beween them, painted eight of the first thirteen chairmen. Watts did three. 1893. Aluminium statue of ‘Eros’ over a fountain commemorating Anthony Ashley Coper, Earl of Shaftesbury by Sir Alfred Gilbert RA (1854-1934). Piccadilly Circus. Unveiled on 29 June 1893. 1894. Drinking Fountain to commemorate Sidney Gilchrist Thomas (1850-1885). Meath Gardens. Erected in April 1895. Meath was originally Victoria Park Cemetery and became a public park in 1894. 1892. Sir John Hutton (1842-1903) by Leonard Watts (1871-1951), [No.3]. Chairman of the London County Council from 1892-1895. Watts’s first portrait was of Sir John Hutton and is a rather dull affair, its sole distinction being that it retained its original gilt frame whereas all the portraits till no.55 are framed in standard black and gilt. The painting is almost twice the size of the others and it may be the Council did not want to cut the canvas to make it uniform with the others when the first twenty odd portraits were reframed. Watts studied at the St John’s Wood Art Schools and at the Royal Academy School where he won the Landseer Prize. Sir John Hutton was Chairman of the LCC from 1892-1895 and was an MP from 1889-1901 and proprietor of the Sporting Life. He was knighted in 1894. I could find nothing about Sir John other than the brief details above. 1897. Drinking Fountain commemorating Charles Button, Well Street Common. Made of polished red granite. Erected in 1897. The Common vested in 1872 in the LCC’s predecessors the Metropolitan Board of Works. 1897. Drinking Fountain commemorating Lady Henry Somerset (1851-1921) by George Edward Wade (1853-1933). Victoria Embankment Gardens. Fountain consisting of a granite base suggestive of a tumulus of rough stones, surmounted by the bronze figure of a young girl bearing aloft a shallow basin. Unveiled on 29 May 1897. Lady Henry was a social reformer and advocate of temperance. All the bronze has been stolen. 1895-1897. Sir Arthur Arnold (1833-1902) by Leonard Watts (1871-1951). [No 4]. Chairman of the LCC from 1895-1897. A rather forbidding portrait but hidden behind it is a fascinating man. A brief account of his life will give some indication of the kind of person who was attracted to local government in the 1890s. He was declared tdo be delicate as a child and in consequence was education at home. He eventually became a surveyor and land agent but cherishing literary ambitions wrote two ‘sensational’ novels. Ralph or St Sepulchre’s and St Stephen’s (1863) and Hever Court (1867). As an Assistant Commissioner (and later Inspector) of Public Works in Lancashire, during the Cotton Famine, he wrote A History of the Cotton Famine (1865) having witnessed the terrible destitution of the cotton operatives of Lancashire. He also became closely involved in the Thames Embankment construction proposals and produced a pamphlet on the Thames and the Wharf Holders. Touring southern and eastern Europe let him to arouse Phil-Hellenic sympathies with his published descriptive letters From the Levant (1868) which led to him being awarded the Golden Cross of the Order of the Saviour of Greece. He then became the first editor of a new evening Liberal newspaper, The Echo. On resigning from his post he started on a journey through the East with his wife, riding 1000 miles through the whole of Persia, and subsequently wrote a spirited account of his adventures in Through Persia by Caravan (1876).He entered Parliament as MP for Salford in 1880 and was considered by many to be one of the most effective speakers in the House of Commons. He was defeated in 1885, abandoned central government politics and devoted his energies to municipal government and was elected an alderman on the formation of the LCC and was chairman of the council from 1895 to 1897 and knighted in 1895. Such was one of the men who were to lay the foundation stones of what was to become the world’s largest and possibly most famous urban authority until Mrs Thatcher in a fit of pique destroyed its successor in order to topple Ken Livingstone her arch enemy into whose unfortunate and despicable hands the GLC had fallen. 1897. Sir William Job Collins KCVO MD, FRCS, DL (1859-1946) by Herman Gustave Herkomer (1863-1935) [No.5]. Chairman of the LCC from 1897-1898. This oval portrait was set into a permanent frame in a panel above the fireplace in Room 130 of the principal floor, County Hall. Collins was a surgeon a Fellow of the Royal College of Surgeons and was knighted in 1902. He was elected to the staff of the Royal Eye Hospital and the Western Ophthalmic Hospital, and was for many years ophthalmic surgeon to the Temperance Hospital and to the Hampstead and Northwestern Hospital. In 1897 he published a useful treatise on Cataract, which reached a second edition in 1906. He also wrote biographies of his heroes Sir Samuel Romilly (1908) and Sir Edwin Chadwick (1924) and made serious excursions into philosophy, publishing a study of Spinoza, and in 1905 Physics and Metaphysics. He was a member of the Huguenot family of Garnault and was President of the Huguenot Society from 1926-1929. He was appointed as the Plenipotentiary for Great Britain at three International Opium Conferences at the Hague between 1911, 1913 and 1914. He was a Fellow, Scholar and Gold Medallist in sanitary science and in obstetrics of London University. He was a Senator of London University from 1893-1927. He was elected Liberal MP for St Pancras West, 1906–1910, and for Derby in 1917-18. In parliament he was particularly instrumental in promoting the Metropolitan Ambulance Act, that resulted in the establishment of the London ambulance service. As chairman of the LCC in 1897 he presented the Council’s address to Queen Victoria at her diamond jubilee. He represented West St Pancras for the Progressives on the LCC. Herkomer was born in Cleveland, Ohio, cousin of Sir Hubert von Herkomer. He moved to England in 1881 and studied under his cousin at Bushey Exhibited at the RA. 1898. Thomas Mckinnon Wood (1855-1927) by Leonard Watts (1871-1951) [No.6]. Chairman of the LCC 1898-1899. Wood subsequently became the Liberal MP for St Rollox Division, Glasgow 1906-1918. Wood was the son of an Orkney farmer but the family settled in London and Wood was educated at Brewers Company Grammar School and University College, London. He worked for a while for the Encyclopaedia Britannica. During his term in parliament he became Private Secretary to the Board of Education 1908, Financial Secretary to the Treasury, 1911-1912, Parliamentary Under Secretary to the Foreign Office 1908, Secretary for Scotland, 1912-1916 and Financial Secretary, Treasury and Chancellor of the Duchy of Lancaster 1916. For the LCC he represented Central Hackney from 1892-1907 for the Municipal Reform Party. He served as an Alderman from 1907-1909. He was also Leader of the London County Council from 1898-1907. 1899. Reginald Earle Welby. 1st Baron Welby of Allington GCB (1842-1921) by Sir William Blake Richmond RA (1842-1921). [No.7]. Chairman of the LCC 1899-1900. Welby was educated at Eton and Trinity College, Cambridge. He entered the Civil Service and joined the Treasury in 1856. By all accounts he was an untidy man and ‘loved a litter’ around him at his office, he was also very slow in making decisions. However, he seems to have been a very affable and entertaining man with a fund of witty stories about old world officialdom. He remained a bachelor and enjoyed going out in society. He also entertained on a large scale and his dinners were reputed to be perfection and to ‘hear a conversation between him and his cook was an education in culinary science’. He was said not to be vain or conceited but was very keen on the observance of good manners at all times and in all places. He admired Queen Victoria for refusing to see Civil Servants. Apparently she insisted on speaking only to ministers and not their ‘servants’. One cannot help feeling that it was probably a relief to him that she took such a stand, but it is likely she would have enjoyed his company even if she never got a straight answer from him. Welby was Alderman for the Progressive Party from 1894-1907 and has served as Permanent Secretary to the Treasury from 1885-1894. Richmond was the son of the great artist George Richmond RA and studied at the RA schools with some earlier coaching from Ruskin. He was greatly influenced by Leighton and though his main ambition was to paint big neo-classical scenes, he had a large portrait practice and painted among others, Darwin, Browning, Gladstone and Bismark. He was elected an RA in 1895 and was knighted in 1897. 1899. Bronze bust of Sir Joseph William Bazalgette (1819-1891) by George Blackall Simonds (1843–1929)George Simonds was erected in the Victoria Embankment Gardens and was maintained by the LCC. 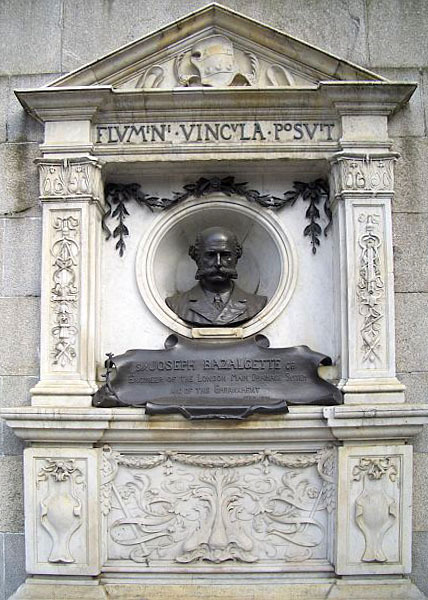 Bazalgette was responsible for laying out the Victoria Embankment Gardens. 1900. Drinking Fountain commemorating Edmund Hooper Galton, Brockwell Park. Polished red granite and Portland stone. Erected in July 1900. 1901. Drinking fountain commemorating William, Esther and Anne Du Bois. Grey granite. Erected in 1901. 1901, Drinking Fountain commemorating Anne Du Bois. Archbishop’s Park. Polished red granite. Erected in 1901. 1901. Sir Andrew Mitchell Torrance (1846-1909) by the Hon. John Collier (1850-1934) [No.9]. Chairman of the LCC 1901-1902. He represented East Islington for the Progressives from 1889-1907 and was a Liberal MP for Central Glasgow from 1906-1919. He was educated at Cumnock parish school and in 1861 was apprenticed to Peter Kelso & Co., muslin manufacturers of Glasgow. In 1863 he moved to London and worked for Smith, Anderson & Co. In 1875 he became a partner and the firm changed its name to Miller, Son, & Torrance. He was given a knighthood in 1906. He was involved in Islington Borough municipal politics, being elected to the Council and serving as Mayor of Islington from 1903-1905. 1901. Horniman Museum. F. H. Horniman had, during Dickinson chairmanship, written to him offering the Council his private museum and its collections which he had amassed over a 25 year period together with 15 acres of land. Before it could accept it, the Council had to seek the necessary statutory powers to run a museum and these were granted by section 36 of the London County Council (General Powers) Act, 1901. Under these the Council was to use it as a public museum for the people in perpetuity. The museum’s collections fell into three categories, ethnographical, natural history and music The museum was opened in 1901. 1901. Marble Hill House. A conference was held in County Hall on the 19 July 1901 to discuss how to save Marble Hill House, Twickenham from destruction and the surrounding park from development. It was attended by many local authorities and preservation societies. The result was that the London, Surrey and Middlesex County Councils, Richmond Corporation and Twickenham Urban District Council, assisted by various charitable bodies, contributed towards the purchase of the House and park and on 30 July 1902 the house and park were vested in the LCC. The house had been built for Henrietta Howard, the mistress of George II. It had been ripped bare of its contents and was in a parlous state. Over a period of years the LCC and the GLC lovingly restored the house and acquired the collection of paintings and furniture which now adorn it. In 1986 the house and its contents were transferred from the GLC to English Heritage. Staff. John Cranmer Cambridge (d.1901) [no.136]. A sad forgotten memorial in the form of a large engraved brass plaque turned up in a dark corner of the basement of County Hall. It is inscribed ‘To the memory of John Cranmer Cambridge aged 23 years who lost his life at Ostend on 8 August 1901 after effecting a brave rescue from drowning. This tablet was erected by his brother officers of the London County Council as an expression of their admiration of his act of bravery and self sacrifice. Presumably it had adorned the walls of County Hall for a period and then had been taken down and consigned to the Cellars [no.136]. 1902. Bronze statuary group of Boadicea and her two daughters in a pair-horse chariot by Thomas Thornycroft (1815-1885). Victoria Embankment by Waterloo Bridge. The pedestal is brickwork faced with granite with a cover of bronze designed by J.G.Jackson. Presented by Sir John Isaac Thornycroft. Cost of the casting was met by public subscription. Erected in 1902. 1902. Sir John McDougall (1844-1934) by George Spencer Watson RA (1869-1934) [No.10]. Chairman of the LCC from 1902-1903. A businessman, McDougall was one of five sons of Manchester flour merchant Alexander McDougall, who, in 1845 set up as a manufacturing chemist, and in 1864 recruited his sons into the flour business. Sir john helped establish and grow the family’s flour business in London, including the construction in 1869 of the Wheatsheaf Mill on the southern quay of the Millwall Outer Dock It was demolished in 1980. He was a Fellow of the Chemical Society. He left the family business in 1888 to become a local councillor, focusing in particular on lunatic asylums and drains. He was a member of the Progressive Party and was elected to London County Council, representing – with Will Crooks – the Tower Hamlets district of Poplar from 1889 to 1913. On 26 June 1902, during his chairmanship of the LCC, it was announced he would be knighted as part of the Coronation Honours of King Edward VII the knighthood being conferred in a ceremony on 24 October 1902. Watson was a portrait and figure artist who studied at the Royal Academy Schools from 1889. He was elected an RA in 1932. He lived in Dorset and London. The titles of some of his paintings made interesting reading: ‘Joseph interpreting Pharoah’s Dream, Her hair was long, her foot was light, The Bath of Aphrodite. 1903. Sun dial commemorating Thomas George 1st Earl of Northbrook, and Francis George, Viscount Baring. Northbrook Park. Sun dial commemorates their gift of the park. Erected in 1903. 1903. Drinking fountain in commemoration of Alice Maud Denman and Arthur Regelous. Bethnal Green Gardens. Bronze and emerald pearl granite. Erected in 1903. 1903. Bronze bust of Sir Arthur Sullivan (1842-1900) by Sir William Goscombe John RA (1860-1953) Victoria Embankment Gardens. Bust on a high pedestal against which a bronze figure of Grief is resting. At the base of the pedestal are a mask a lyre and an open score, all of bronze. Unveiled on 10 July 1903. 1903. Ornamental drinking fountain commemorating S. Horace Candler. Brockwell Park. Erected in December 1903. 1903. Robert Collier, 2nd Baron Monkswell (1845–1909) by The Hon John Collier (1850-1934). [no.11]. Chairman of the LCC 1903-1904. A Liberal politician who was briefly Under-Secretary of State for War under The Earl of Rosebery in 1895. He was also Chairman of the Royal Commission on the Health and Safety for Miners and published a novel Kate Grenville. He represented Haggerston for the Progressive Party in the LCC from 1889-1907. As a young man, he was a first-class cricketer. He was born and died in Chelsea. 1904. Sir John Williams Benn, 1st Bt. (1850-1922) by Sir George Clausen RA (1852-1944). [No.12]. Chairman of the LCC 1904-1905. Possibly the finest of these first portraits. Benn is portrayed with pen poised over a sheaf of papers looking directly forward with an unquiet, faintly troubled gaze. Grandfather of Tony Benn MP. Benn was born in Manchester, the eldest son of the Rev. Julius Benn. His parents moved the family to east London, where they opened an institute for homeless boys. Aged 17 he joined a furniture company and later (1880) established a trade journal, The Cabinet Maker, which eventually became the furniture trade’s leading publication. His niece was the actress Dame Margaret Rutherford, the daughter of his younger brother William Rutherford Benn who was put into a lunatic asylum following his murder of their father the Rev. Julius Benn. When the LCC was established in 1889, Benn accepted an invitation to stand as a Progressive Party candidate for East Finsbury and was elected. He was active in the London Dock Strike of 1889 and was invited to stand for Parliament in 1891 as the Liberal candidate for St George Division of Tower Hamlets 1892-1895 and Devonport 1904-1910. For his work as an MP, he was knighted in 1906 and created a baronet in 1914. Clausen of Danish descent painted mainly landscapes and figure subjects. He left school at 15 and spent his evenings studying in the schools a South Kensington. He studied in the studio of Edwin Long RA, and subsequently in Paris under Bouguereau at the Academie Julian. He was an admirer of the naturalism of the painter Jules Bastien-Lepage. Clausen was a founding member of the New English Art Club in 1886. In 1895 he was elected an Associate of the Royal Academy and became a full Academician in 1906 and also became a Professor of Painting at the Royal Academy He was an official War Artist during the 1st World War. 1904. Bust in relief of Sir Walter Besant (1836-1901) by Sir George Frampton (1860-1928). Victoria Embankment. A bronze replica of the memorial in St Paul’s Cathedral. Presented by the Society of Authors. Erected in December 1904. The statue is the only outdoor one which has spectacles. 1905. Sir Edwin Cornwall, 1st Baronet (1863-1953) by The Hon. John Collier (1850-1934). [No.13]. Chairman of the LCC 1905-1906. Politician and coal merchant. Cornwall was born in Lapford, Devon and at the age of thirteen he became a clerk in a coal merchant’s in Hammersmith, by seventeen he wwas manager of the company’s depot at Kensington. A few years later he set up his own coal business. Knighted in 1905. Created Baronet in 1918. MP for Bethnal Green North East 1906-1922. Deputy Speaker of the House of Commons 1920-1922. He was the first mayor of Fulham Borough Council. As a member of the Progressive Party in the LCC he represented Fulham from 1892-1898 and North-east Bethnal Green from 1898-1910. He took a prominent part in securing the approval of the Council to the Kingsway and Aldwych Scheme (see below). From December 1916 to February 1919 he served as Minister of National Health Insurance and was Comptroller of the Household from 1918 to 1922 His recreations were golf and travelling. The Islingtonians by Sir Bertram Mackennal RA (1863-1933). Highbury Fields. Memorial to 116 Islingtonians who died ithe Douth African War. It consists of a bronze figure of Glory holding a figure of Victory in her right hand, in her left is a wreath of laurel. t her feet on he pedestal (of Portland Stone) are arms,flag and helmet (in bronze) and on the pedestal are bronze tablet with the names. Unveiled on 15 July 1905. Bronze statue of William Ewart Gladstone (1809-1898) by Sir William Hamo Thornycroft RA (1850-1925). Aldwych/Strand. Pedestal of Portland stone, Gladstone shown dressed in robes of Chancellor of the Exchequer. At the foot of the statue are four bronze groups representing Brotherhood, Education, Aspiration and Courage. The statue was unveiled on the 4th November 1905. 1905. Kingsway and Aldwych. These roads were purpose-built as part of a major redevelopment of the area in the 1900s. Its route cleared away a maze of small streets and the surrounding slum dwellings. A beautifully designed ceremonial gilt and enamel key [No.587], made by Spink and Sons, silver mark CW London 1903 was specially made for the opening of Kingsway and Aldwych by Edward VII on 18 October. There is also a commemorative medallion, again by Spinks [no.348]. 1905. Steamboat Service. The LCC introduced is Steamboat Service and the Heritage Collection recorded three mementoes of the inauguration: a souvenir ticket [no. 329], a Commemorative tin [no.578] and six coins in a presentation box [No.579]. The label on the box says it all. ‘Inauguration by His Royal Highness the Prince of Wales of the Council’s service of steamboats on the Thames on Saturday 17 June 1905. These coins were tendered by their Royal Highnesses the Prince of Wales, Prince Edward of Wales and :Prince Albert of Wales in payment for the first circular journey from Westminster to Greenwich by Steamboat and from Greenwich to Westminster by Tramcar. They were the first fares received by the London County Council for the carriage of passengers by Steamboat. The coins which were minted specially for the purpose are three silver four penny pieces and three silver pennies. Those in the first row being tendered by the Prince of Wales, those in the second by Prince Edward and those in the third by Prince Albert.’ Finally the Commemorative tin with the Royal couple. 1906. Sir Evan Spicer (1849-1937) by Sir William Newenham Montague Orpen RA (1878-1931) [No.14]. Chairman of the LCC 1906-1907. Governor of Dulwich College, Alderman of the LCC 1889-98 and 1901-1907 and represented South Newington on the LCC from 1907-1919. He was also a Chevalier of the Legion of Honour. Evan Spicer was a wholesale paper manufacturer, stationer and philanthropist and was a leading Congregationalist and President of the British and Foreign School Society. He led the way in the establishment of the South London Polytechnics Institutes Scheme. He chaired the first Finance Committee for Battersea and was a founding trustee of the City Parochial Foundation from 1891 until 1937. 1907-1908. Sir Richard Atkinson Robinson (1849-1828) was Leader of the London County Council. 1907. Sir Henry Percy Harris, MP (1856-1941) by Sir William Newenham Montague Orpen RA (1878-1931) [No.15]. Chairman of the LCC 1907-1908. MP for South Psddington 1910-1912. As a member of the Municipal Reform Party he represented South Paddington on the LCC from 1892-1910. Knight of the British Empire. Harris was educated at Eton and became a barrister. In 1926 Harris presented the Council with a bronze copy of the Vatican Laoccon [no.589]. In 1985 the bronze was found in the County Hall cellars covered in dust and grime where it had laid for as long as anyone could remember. It is known that it had been removed for safety to the record office in 1939 and had originally been placed in the Members’ Reading Room (r.115) but in all probability it never returned. 1907. The Assessors by Joseph Finnemore (1860-1939) [no.864]. The architectural competition for the design of the new County Hall on the South Bank was held in 1907. One hundred and fifty-two architects working singly or in collaboration, produced nine-nine different designs. Fifteen of these together with eight by leading architects selected by the Council were placed before the assessors of the competition who, having no knowledge of the authorship of the designs, chose that of Ralph Knott, a thirty year old architect who had not before designed a building of any significance. A large watercolour group portrait recording the event was presented to the Council in 1040 nu the daughters of the artist. The work depicts the assessors Norman Shaw RA (1831-1912, architect, Sir Aston Webb PRA (1849-1930) sculptor and W. E. Riley the Council’s Chief Architect in the act of judging the designs for County Hall; they are in fact looking at that what appears to be Knott’s design. It is a unique record of the event if an indifferent work of art. Ralph Knott never saw the completion of his masterpiece. He died at the age of 50 in 1929. the main block of County Hall was completed in 1922 but the north section of the building was not completed till 27 January 1933. Finnemore was a figure painter, etcher and illustrator. Born in Birmingham he studied there and the Antwerp Academy. He returned to England and settled in London in 1881 after extensive travels in Malta, Greece, Turkey and Russia. He was a noted illustrator of magazines and lived for a period in Northwood, Middlesex. The painting was displayed in County Hall for a considerable number of years but, sad to relate, it then disappeared. However in 1989 it was found minus frame and covered in grime in the sub-basement carpet store of County Hall while the final clearing out of the building was taking place. The LRB arranged for it to be restored and framed and it was eventually handed over to the Guildhall Art Gallery with the remainder of the paintings in the Collection. It was last seen hanging in the Guildhall (1990). County Hall by Harold Wyllie OBE (1880-1973) [No.140]. Another relic of the competition was also discovered in the cellars in 1985. A large romantic painting by Wyllie of one of the projected designs for County Hall. It shows County Hall rising from a misty boat-bedecked Thames viewed from the Victoria Embankment. It must be one of the competition designs for County Hall, but whose? One nice touch of artistic licence shows that Boadicea has driven her chariot from the north bank and come to rest on the plinth now occupied by the South Bank Lion. Wyllie was a marine artist. He took up art when he was unable to join the Navy He went to New York for a period as an artist for The Graphic. He fought in the Boer War and served in the Royal Flying Corps in France as a pilot in 1914-1918. He was awarded the OBE in 1919 and was granted the rank of Lieutenant-Colonel on retirement in 1920. He lived in Portsmouth and Perthshire. 1908. Swinton’s tale continues. ‘The success with the Orpens spurred us on to high aims and we went for the gloves. The doyen and perhaps the most honoured of our portrait painters living at that moment was Sir William Orchardson RA, Most fortunately I happened to know him personally. He was a brothber Scot, and when he first came south he had been helped by one of my relations. I was therefore encouraged to go to him and explain to him our situation, p;onting out how our gallery had started, and was growing and must continue to grow, and how we were tied financially ‘Would he’ I asked ‘give a present to London and paint us a picture for £100’. He replied ‘Of course I will’ and the Pass was son. I believe his portrait of Sir Richard Atkinson Robinson (1849-1928) Chairman 1908-9. was about his last completed work. Anyway we had found the key to our difficult position. The next Herkomer, the man we approached’ (under whom Swinton had studied) ‘replied ‘Of course I will do what Orchardson has done’, and thus started, for eighteen years the formula ran, to one painter after another’. Orchardson’s letter to Swinton, written on 8 February, two months before his death on 13 April 1910, regretted he would not be able to attend the meeting at which his portrait was to be presented to the Council. 1908. Sir Richard Atkinson Robinson (1849-1928) by Sir William Quiller Orchardson RA. [No.16]. Chairman of the LCC 1908-1909. The portrait of Robinson which Orchardson painted at the age of 77 is bright and vigorous, no concession is made to a pose and the shoulders fragment into the background leaving the strong face and its humours gleam. The painting is signed WHO and dated 1910. Robinson was the son of a Whitby ship owner, took a prominent part in political and municipal work and was a member of the Thames Conservancy, Governor of the Imperial College of Science and an alderman of Kensington. He was a member of the Municipal Reform Party and represented South Kensington on the LCC from 1896-1910. Orchardson was born in Edinburgh and had been a pupil of Lauder. He came to London in 1862 . He first painted historical genre and later turned to psychological dramas of upper-class life for which he is now best known. He was also a distinguished portrait painter. He was knighted in 1907. 1908. Rotherhithe Tunnel. The Prince of Wales opened the Rotherhithe Tunnel on 12 June 1908 and a beautiful ceremonial key in gilt and enamel was made for the occasion [no.557] by Spink and Sons who also made a Commemorative Medallion [no.349]. 1909. Sir Richard Melville Beachcroft (1846-1926) by Sir Hubert von Herkomer CVO, RA (1849-1914). [No.17]. Chairman of the LCC 1909-1910. He was a Master of the Clothworkers’ Company 1913-1914, with which his family had been associated for six generations. His ancestor Sir Robert Beachcroft had been Lord Mayor of London in 1711. Beachcroft was educated at Harrow and became a solicitor. He was the first chairman of the Metropolitan Water Board 1903-1908. As a member of the Municipal Reform party he represented North Paddington from 1889-1892 and 1901-1907. He served as an Alderman from 1892-1898 and then represented Central Finsbury from 1898-1901 and South Paddington from 1907-1910. Beachcroft, when Deputy Chairman, presented the Council with a painting of Old Waterloo Bridge and the South Bank by Gerald Maurice Burn (1862-1945) [no.99], The paintings shows Cleopatra’s Needle, Waterloo Bridge, first called the Strand Bridge which was erected 1911-1817 by John Rennie (1761-1821), demolished in 1936. St Paul’s Cathedral on the left skyline and the tower on the right skyline is the ‘Shot Tower’ the Patent Shot Manufactory, erected in 1789 and demolished in 1937. Burn was born in London and studied art at South Kensington, Cologne and Dusseldorf, Antwerp and Paris. He mostly painted marine subjects and battleships. He exhibited at the Royal Academy between 1885-1911. Herkomer’s portrait of Beachroft was not too successful, but the subject with his walrus moustache would have tested anyone and Herkomer was probably the most suitable person to tackle him as Swinton probably guessed. Herkomer’s The Last Muster – Sunday at the Royal Hospital Chelsea, Lady Lever At Gallery is full of Beathcrofts, though it must be admitted that Sir Richard still has a spark in his eyes. Herkomer was born in Bavaria and emigrated to England with his father, a woodcarver. He was largely self-taught as a painter and became outstandingly successful as a portrait painter and later opened his own art school in Bushey, Hertfordshire. 1909. George Frederick Young (1791 – 23 February 1870) by Eden Upton Eddis (1812-1901). The portrait was presented to the LCC by the sitter’s son Sir Frederick Young (1817-1913). George Frederick Young was a shipbuilder. He was MP for Tynemouth 1831-1838 and Scarborough 1847-1852, a magistrate for Middlesex and Deputy Lieutenant of the Tower of London. Young was one of the originators of the scheme for acquiring Victoria Park, London in 1842, opened to the public in 1845. The land had originally been acquired by the Crown Estate, it had been known as Bonner Fields, after Bishop Bonner, the last Lord of the Manor of Stepney but had been spoiled by the extraction of gravel, and clay for bricks. I have not been able to find out who donated replica statues of the Dogs of Alcibiades which adorn the park. Two pedestrian alcoves, surviving fragments of the old London Bridge, demolished in 1831, were erected in the park in 1860. The alcoves provided protection for pedestrians on the bridge. 1909. A Badge of Office for the Chairman. On 30 November 1909 the General Purposes Committee reported to the Council ‘that it was not in their opinion desirable that any badge or other device should be adopted to be worn by the Chairman of the Council, and that, although a badge was commonly worn as a distinguishing mark by mayors, they thought it unnecessary and distinctly out of place for a badge, robe or scarf to be used to distinguish the Chairman of the Council’. And so the Chairman remained without a badge, for a considerable period. The matter was to be reconsidered in 1926. Bronze statue of Sir Wilfred Lawson (1829-1906) by David McGill (fl.1889-1910). Victoria Embankment Gardens. Statue of Sir Wilfred standing, left hand in coat pocket, notes kin his rigfht hand. Pedestal of stone. Around the base are bronze allegorical figures of Temperance, Peace, Fortitude and Charity. Unveiled on 20 July 1909. Tudor Sun Dial commemorating Felix Mendelssohn-Bartholdy (1809-1847). The sun dial marks the site of the house where Mendelssohn stayed and composed his Spring Song in 1842. Erected in 1909. Drinking Fountain to commemorate Hugh Taylor in Grove Hall Park. Made of emerald pearl Labrador granite. Erected in 1909. Drinking Fountain to commemorate Hugh Taylor in Ruskin Park. Made of emerald pearl Labrador granite. Erected in 1909. 1910-1911. William Hayes Fisher, later 1st Baron Downham (1853-1920) was Leader of the London County Council. 1910. William Whitaker Thompson (1857-1920) by Sir Lawrence Alma-Tadema (1836-1912). [No. 18]. Chairman of the LCC 1910-1911. Thompson was a member of the Municipal Reform Party and an Alderman from 1904-1910. He was also Mayor of Kensington 1911-1921. The choice of Alm-Tadema for the Chairman’s portrait was curious. Indeed, Swinton describes the choice as ‘quaint’. Alma-Tadema was presumably approached by Swinton and presumably accepted the commission. The artist had spent the greater part of his career painting opulent ancient Greek and Roman scenes filled with magnificent textures in the great classical academic manner. The prices he commanded were astronomic by aby standards and yet, apparently, Swinton managed to persuade him to serve London by painting, the year before he died, a strking and impressive piece. It is a quiet and restrained work with no glossy props except for a beautiful carnation on Whitaker Thompson’s lapel. It is doubtful whether Swinton had been able to persuade him to follow in Orchardson’s footsteps, and yet he must have done so. Unfortunately there are no letters between then. Major-General William Frederick Cavaye (1845-1926) by unknown artist. In 1910 Cavaye was elected to the LCC as a Municipal Reform councillor for South Kensington. He held the seat for fifteen years before retiring from the LCC at the 1925 election due to ill-health. He became the Mayor of the Royal Borough of Kensington. He was born in Edinburgh and was educated at the Edinburgh Academy and entered the Royal Military College, Sandhurst. In 1865 Cavaye was commissioned as an ensign into the 107th Regiment of Foot/Royal Sussex Regiment and rose through the officer ranks till he became the battalion’s commanding officer with the rank of lieutenant-colonel on 15 August 1883. He was then made a Colonel and was on ‘special service in the Second Boer War 1899-1902 and mentioned in dispatches. Following the outbreak of the First World War he returned to active service and was appointed commanding officer of the 2nd East Anglian Division in 1914 with the rank of brigadier-general. He subsequently served on “special service” with the British Expeditionary Force in France from 1917 – 1919, and was raised to the rank of major-general. The painting was dumped in the County Hall carpet store in the basement from which it was rescued. 1911. Sir Edward White (1847-1914) by Sir Edward Poynter, Bt. GCVO, RA (1837-1919). [No.19]. Chairman of the LCC 1911-1912. White was a member of the Municipal Reform Party and represented West Marylebone from 1895-1904 and 1910-1914. Poynter was Swinton’s next choice and was one of the last standard bearers of the same classical academic tradition and well suited to follow Alma-Tadema. The painting is however not very effective and would be hard to distinguish from a score of similar portraits of the period. White was Swinton’s predecessor as Chairman. 1912. Laying of the County Hall Foundation Stone. It was during White’s chairmanship that King George V laid the foundation stone of the new County Hall on Saturday the 9th of March 1912. Three days later on the 12 March Swinton was elected Chairman. The Council minutes of 12 March 1912 record that George V and Queen Mary, accompanied by the Prince and Princess of Wales were received at the entrance to the pavilion erected at the site of County Hall. by White, Swinton (as Vice-Chairman) and Arthur Russell who represented Central Finsbury (as Deputy Chairman). ‘Miss Elizabeth Swinton, daughter of the Vice Chairman of the Council had the honour of presenting a bouquet to Her Majesty and a bouquet to Her Royal Highness Princess Mary’. White’s ‘Loyal and Dutiful Address’ to the King included the following: ‘Your majesty has recently come from India after there constituting the ancient City of Delhi to be the Capital City of India, and we are ambitious enough to hope that Your Majesty desired to emphasise the fact that the first open public act to be performed by Your Majesty should be connected with London, the historical capital of the Empire….. The site of the New County Hall is historic and in several interesting directions, and the new building which is to be erected thereon, is being devoted to the ever-growing interests of the ratepayers and inhabitants of London, will become the home of great efforts, and it is hoped great accomplishments for the common good of London.’ The King’s reply is worthy of being quoted extensively, and should have been thrown in Mrs Thatcher’s face when she set about destroying the GLC. ‘….. the Queen and I are especially glad that this ceremony should be the first undertaken by us since our return from India…. The position of London as the capital of the empire, and in many aspects the centre of the world, finds expression in the noble Parliament House that faces us across the river, in the great Government Offices that have gathered beside it, in the Civic Buildings of the ancient City, and in the mighty houses of commerce that line our squares and streets. But we can point to few buildings that speak of the modern County of London, and to none that sufficiently exemplify its corporate unity and proclaim its pre-eminence in the sphere of local government. When this County Hall has arisen on the banks of the river that has shaped London’s destinies, you will at last have provided a fitting centre and home for the far-reaching and varied energies demanded by the administration of London, and so have removed a reproach which falls upon no other capital city. The Council has in the past executed its trust with diligence and devotion, but when your deliberations are carried on in surrounds worthy of their importance, and your varied functions are organised under one central roof, there cannot fail to result a growth of efficiency, a more harmonious co-operation and an increasing unity of purpose. But above all, I hope that the burdens placed upon your shoulders will be lightened by the awakening in Londoners of a deeper pride and livelier interest in the successful solution of the problems that confront their municipal representatives.’ The Archbishop offered prayers and then White read out to the King and Queen a list of the coins and documents which had been placed in the foundation stone. These were enclosed in a bronze box and placed in the foundation stone by the Chairman of the Establishment Committee. The Ceremonial tools for the laying of the foundation stone of County Hall. [Nos.563-569] Ralph Knott handed the King a trowel, specially made by the students at the Council’s Central School of Arts and Crafts. The architect of the Council then handed the King a mallet to tap the stone on its bed together with a plumb rule, with which the king tested the accuracy of the fixing of the stone. The King then declared the stone well and truly laid. ‘the declaration being accounted with a flourish of trumpets’. The royal party were then taken to a platform to view the site of the building works and from there they went to a withdrawing room where the king was presented with copies, ‘specially bound in covers made by students at the Council’s Central School of Arts and Crafts, of a descriptive account of the new hall’. The king then knighted chairman White and Maurice Fitzmaurice, the Council’s chief engineer. The design of the ceremonial items used for the laying of the foundation stone had been commissioned by the Council from Onslow Whiting. The trowel, spirit level, mallet and plumb rule now formed part of the Heritage Collection. Set with amethysts and opals, the mallet is of solid ebony with silvr bands, and as a magnificent deeply sculpted silver Royal Coat-of-Arms as its base. The spirit level is another novelty. The spirit is encased in a silver edged pool and is decorated in silver with two large amethysts. Gazing into the (pool) level with some amazement is a small silver putto with outstretched arms. Very theatrical. The trowel is engraved silver with an ebony handle topped with a carved rock crystal an embellished with two bands of amethysts and opals. There remains the plumb-rule. On a platform of ebony decorated in silver and set with amethysts stands a silver classically draped female, who with outstretched hands, holds a string from which is dangling a small pitcher. The pitcher hangs over a silver crescent moon. One wonders what George V made of this confection. Clearly, from the account in the Council’s minutes he actually made use of them on the foundation stone. Each piece is engraved with the legend ‘Designed by Onslow Whiting, made by C. Welch and students of the Central School of Arts and Crafts. 1912. Captain George Sitwell Campbell Swinton, DL (1859 – 1937) by John Singer Sergent RA (1856-1925) No.20. Chairman of the LCC 1912. Swinton’s portrait by Sargent dated 1912 the year of Swinton’s brief chairmanship of the LCC is the only one of the Chairman’s portraits which is not an oil. The drawing did not join the LCC’s collection until May 1925 when Swinton presented it to the Council requesting that it be hung over the Bear and Beehive fireplace in Room 118 of County Hall. The Bear and Beehive fireplace depicts a scene from the Aesop Fable The Bear and the Beehive in its central panel (based on a design by Francis Barlow published in 1665-1666). The mantelpiece was removed in 1913 from the rear portion of Ancaster House, No.59 Lincolns Inn Fields when it was acquired by the Council for the formation of Kingsway. In 1922 it was erection its present position. The fireplace is believed to be designed by Isaac Ware (1704-1766), architect, who carried out alterations at the house in 1751-2, the sculptor being William Collins (1721-1793). Swinton’s portrait. Let Swinton tell the tale of his drawing. ‘Perhaps I ought to add something else, an explanation rather more personal. I happened to be on intimate terms with Sargent – and he had painted (1896-7) and drawn (1906) my wife’ 9the painting is now in the Art Institute of Chicago) ‘but all these years he was the most sought after portrait painter in the wide world. Moreover he was not a Briton. I did approach him once but it was at an unfortunate moment when he was overwhelmed with work and far behind with his promises’ (the letter from Sargent is preserved with Swinton’s note) ‘And he died comparatively-speaking young. Had he lived longer I always had it in mind that if the Council should choose a Chairwoman he might have been asked more easily to do something that no other had done, but his end came suddenly and quite unexpectedly. Curiously enough he had done a charcoal sketch of the one person who had only occupied the Chair for a few weeks and then resigned. This councillor, of course, had not been painted for the Council, Later the Council was offered and accepted this drawing and I see that it is catalogued in the printed list of Chairman’s portraits. But is, of course, at the County Hall on an entirely different footing, and is hung apart from the pictures’. Little did Swinton realise the treatment the drawing was to receive. At some time, probably during the war, Sargent’s drawing was moved to the cellars of County Hall, never to return. It was certainly seen in the cellars in the early 60s with a large number of other discarded portraits and furniture. It was eventually rescued by John Jacob, curator of Kenwood, who found it with its glass broken and frame shattered. He removed it to Kenwood for safety. I brought it back to County Hall and handed it to John Burgess, the Clerk of the Members’ Service Unit to arrange for it to be framed. By some quirk of fate, Burgess occupied the Bear and Beehive room in which Swinton had wanted his portrait hung. After it had been reframed it returned to its original room for two days in 1986 before finally joining the other portraits for packing and storage during the last days of the GLC. Swinton was a member of the Municipal Reform party and represented Holborn from 1901-1907 and represented Dulwich from 1922 -1928. (see above for biography of Swinton). Death of W. S. Hill. The Establishment Committee reported to the Council on 7 May 1912 that W.S.Hill, a materials inspector, whilst stepping from a scaffold on to a window sill of the shell of the new County Hall, fell through a window opening and died. He was 53 years of age, had been in the service of the late School Board for London and the LCC for 20 years. His rate of pay was £3.3s per week. The First School Empire Day Celebration at the Medburn Street School, London 1910 and Drawing Class at Work at the Medburn Street School, London 1912 by Joseph William Topham Vinall (1873-1953). [Nos 133 and 132 respectively] These two paintings entered the Heritage Collection from the dusty cellars of County Hall. Why these charming and naïve works finished up there is anyone’s guess. They had originally been gifted by the artist. The subjects were described in the Council Minutes for 21 March 1944 as depicting scenes at the Medburn Street LCC School, St Pancras. One represents the first school Empire Day celebrations in 1910, the actual scene being a break for prayer on that occasion: the other shows a drawing class at work in 1912. Vinall was born in Liverpool and painted portraits, landscapes and architectural subjects. The school in Camden dates from 1873, when the London School Board leased the site, although a school had existed there before. The new school was completed and opened in 1877, as “Medburn Street School”. 1913. Emma Cons (1838-1912). The LCC Minutes of 28 October 1913 record that the Emma Cons Memorial Committee had presented to the Council a portrait of the late Emma Cons who had served as an alderman on the first Council from 1889-1892. Unfortunately the present whereabouts of the portrait is unknown, though there is (was?) a plaster cast tablet incorporating a portrait of Emma Cons on the wall of the Conference Hall in County Hall. The cast was from a bronze relief by the Welsh sculptor Sir William Goscombe John (1860-1952) famous for his many very moving war memorials across the country. Emma Cons was a British social reformer, educationalist and theatre manager. She founded a Working Girls Home, a hostel in Drury Lane, Morley College, London and famously the founder of the Old Vic theatre in London. 1913. Sir Cyril Stephen Cobb, KBE, MVO (1861-1938) by William Strang RA (1859-1921) [No.22]. Chairman of the LCC 1913-1914. Cobb was a barrister-at-law and was knighted in 1918. He was a member of the Municipal Reform Party on the LCC and represented Fulham from 1905-1919 and West Fulham from 1919-1934. He was an MP (Unionist) West Fulham 1918-29 and from 1930. William Strang another Scot, was born in Dunbarton and studied under Poynter and Legros. He painted a rather stiff, self-conscious pose, imposed it is feared b Cobb wishing to have an important paper in his hand, though Strang was not averse to his sitters having such props. The one in question was a small painting of the coat-of-arms of the London County Council. It is not clear from the papers whether Cobb helped design the coat o-of-arms, but certainly it was his idea that the Council should have one and from the painting it does seem as though he had just put the finishing touches to its design. LCC Coat of Arms. [Nos 518-520] The first suggested design for the coat-of-arms, details of which were reported to the Council on 24 February 1914, was an elaborate affair sporting the Imperial Crown, the Tower of London, an ancient galley and a lion. The supporters were to be a Roman officer and a Saxon warrior. A motto was also chosen – Loci dulcedo nos attinet – which apparently was taken from the earliest mention of London in history ‘alluding to events in AD61 when the Roman General decided to leave London unprotected from the assaults of Queen Boudicca and the citizens remained there, according to Tacitus, the pleasantness of the place holds us. A temporary Royal Warrant granting arms to the LCC was signed by George V on 29 July 1914 [No.520] and the final coat-of-arms was granted to the Council on 14 August 1914 [no.519] 35 years after the Council had been created and just fifteen days after war was declared. The coat-of-arms granted was much simpler than the one reported to the Council, and had no crown, galley, Roman officer, Saxon warrior or motto. Cobb informed the Council he was prepared to accept, and in fact did pay for, the cost of applying for the coat of arms as a memento of his year of office. It was therefore understandable that he wished to be depicted holding a painting of it. The LCC was also granted a badge [No.518] on 12 March 1956 through why the long wait between the two is a mystery. I understand that the badge was for ‘everyday’ use and the coat-of-arms for special occasions. As far as I could observe, the coat-of -arms was carved, painted and printed on everything and anything and the badge was just never used. One can’t help feeling that the granting of the badge was received by the officers and never made known to the Council or the Council chose to ignore its existence. I could certainly find no record of it being made official. The Arms: Barry wavy of six azure and argent, on a Chief of the last the cross of St George charged with a lion of England, the shield ensigned with a Mural Crown gold. The blue and silver waves represented the River Thames and the Port of London Authority. The English Lion on a St George’s Cross shows that London was the Royal centre of England encompassing the nation’s capital city, and the gold mural crown indicated that the arms were those of a municipal body. The Badge. An oval azure charged with two bars wavy argent, on a chief of the last a cross throughout gules, the whole encompassed by a rope or. The badge repeated the main motifs from the arms: the blue and silver waves and cross of St George. The badge was encircled by a golden rope for the maritime associations of the county. The Lalique Chalice. [No.283]. During Cobb’s year as Chairman the Council was visited by representatives of the Conseil General de la Seine (City of Paris) who presented him with a beautiful and unique Lalique chalice. It was made of white and gold trnalucent glass with gold bands set into a central column which shows a galleon in full sail beneath a sky of fleur de lys. The rim of the base is inscribed with the motto of the City of Paris which translates as It undulates but is not submerged. The most unique feature of the chalice is also on the base – a shield, with the crest of the London County Council. The chalice is also inscribed with the date 6 Juin 1914 (a date which precedes the date of the granting of the temporary coat-of-arms. Cobb must have regarded the chalice as a gift to him as he took it home as his personal property. The General Purposes Committee reported on 5 July that ‘By his will the late Sir Cyril Cobb had bequeathed free of duty ‘To the London County Council the Crystal Cup presented to me by the Paris Municipal Council’. The bequest was accepted on behalf of the Council. No one knew what had happened to the chalice after that. I finally found it in a cupboard in the Chairman’s Dressing Room, totally unrecognisable and covered in black gunge; it had been used for years as a convenient receptacle for Brasso for when the brass in the Chairman’s office needed to be cleaned. Fortunately, when washed, it proved to be in perfect condition. Imagine my excitement at finding it. Sadly, it now languishes in a box in the bowels of the City of London storerooms, never to be seen again, I despair. Is there no one out there who is prepared to get the City of London to bring it out for display? Landscape with Pines by Frederick E. Bodkin (fl.1872-1922). At about this time, though I can find no record, a painting of what may be a rather romantic view of Hampstead Heath came into the possession of the LCC. Bodkin was a landscape painter who exhibited at the RA from 1874-1902. 1914. William Robert Wellesley Peel, 1st Earl Peel, GCSI, GBE, TD, DL (1867-1937) by Sir William Newzam Prior Nicholson (1872-1949). [No.23]. Chairman of the LCC 1914-1915. Nicholson was another of Swinton’s fellow Scotsmen. A draft of his leter to Nicholson has survived which shows his ‘best cajoling style’ and was sent to the Chairman Peel for his approval. The draft is dated 13 July 1915 and begins ‘Dear Nicholson, I do not know if you will remember me but I think we met at Bushey 20 years ago’ (Bushey is where Hubert von Herkomer has his house and studio) ‘That may hardly appear to justify me in writing you what follows, but here goes’. Swinton then sets out in some detail the tale of the growth of the collection and the artists he had managed to persuade to paint a portrait ‘for London’ for £100, for display at County Hall and goes on ‘The Victim now to be painted is Lord Peel, son of the Old Speaker, a good looking very paintable man’ (the ‘Old Speaker’ of the House of Commons from 1884-1895 was Lord Peel the youngest son of Sir Robert Peel), ‘I have been asked boldly to write and ask if you, as one painting in London, a citizen of our new city would help us on these lines. So long as the Council shall stand as the Municipal Centre of London there will be a fair showing of these pictures. There is nothing more to say . The ides may or may not appeal to you and you may easily be too busy. Personally I think there would be a gap if no Nicholson hung in the County Hall. Will you let me know as soon as possible as I may tell Peel. Lutyens described to me your picture of the Viceroy, and I hope it came off as well as it sounded.’ Peel on returning the draft to Swinton, thought it ‘ought to overwhelm Nicholson – I feel on reading it that he is really the luckiest man in the Kingdom to get a chance which Reynolds might have envied.’ Nicholson replied that he would be delighted to paint the Chairman of the LCC. It appears he had just returned from India and had ‘come back with a hunger for new paint’. Peel writing to Swinton about his completed portrait, said his sister thought the end of his nose was more club-like than in nature’. He himself ‘liked the picture rather better a few sittings back – more vitality about it, I thought’. The portrait is powerful, the strong upright figure and boyish face illuminated by a fierce spotlight. Peel was by all accounts a big man and his conspicuous features were said to be his bright blue eyes and thick moustache. A barrister by profession, he became MP for the Southern Region of Manchester and later served as MP for Taunton. He led an extremely busy life and in 1919 became Under-Secretary of State for War under Winston Churchill. He was a member of the Municipal Reform Party on the LCC and represented Woolwich from 1900-1904, Westminster from 1907-1910 and Kennington from 1912-1919. Nicholson was born in Newark on Trent and studied under Herkomer at Bushey (1888-1889)and at the Academy Julian, Paris. He was a founder member of the National Porterait Society (1911) and was an inspired poster designed of great originality. He designed the sets for the original production of Peter Pan by J. M. Barry (1904) and was knighted in 1936.